“A lot of people talk about leadership and not that many actually do it,” Brown said in an interview with INSEAD Knowledge. INSEAD Dean Frank Brown - INSEAD KnowledgeBrown believes there are seven hallmarks of a great leader. “I think the most important one is how you communicate and how you listen because if you’re going to be a successful leader you’ve got to be a really aggressive learner,” he said. 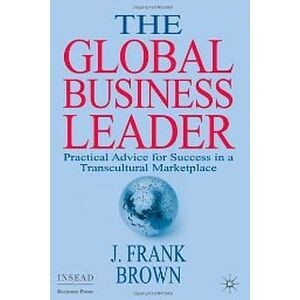 In his book, The Global Business Leader: Practical Advice for Success in a Transcultural Marketplace, Brown lists the hallmarks of leadership: openness, integrity, humility, a view of the present and the future, an optimistic outlook, the proper use of authority, and an understanding of personal and organisational objectives. ‘Transcultural’ leaders at the helm of international companies also need to be sensitive to other cultures and national differences. That means leaders today need to be willing to explore and travel. They need to be curious about other people and customs. “This awareness and willingness to engage and be intellectually curious about what’s going on in the rest of the world is an absolutely critical component to being effective in a transcultural environment, and effectiveness gives you the opportunity to potentially lead,” Brown says. LINOs aren’t very curious and they tend to surround themselves with people who look and think like them. They don’t really want to engage, learn and listen. “In my view LINOs don’t really want your opinion, they don’t really want your input, they don’t really want you on their team. They’d like you to go away and do your job,” he says. But this is a recipe for failure for an organisation. This is especially true for global and regional businesses. Brown tells the story of a deal between a Japanese and American company that went hopelessly wrong because the two parties simply didn’t understand each other’s culture. Success requires diverse teams and Brown says real leaders hire teams with differing skills and backgrounds, give them clear responsibilities, and stay in close touch with the team at all levels. “You’ve got to surround yourself with people that are diverse, have very, very broad perspectives in terms of educational background, in terms of their cultural background, in terms of the languages they speak,” he said. He points to Europe and says the male-dominated and age-hierarchical nature of management doesn’t foster the effective mentoring that brings out the best managers. For transcultural companies to succeed, managers have to be very focused on finding the best person for the job regardless or age or gender, he adds. When executives say that building a diverse team is much more difficult, he tells them that a homogeneous team of white, Anglo-Saxon males won’t be as successful as a diverse team. They share values, resist challenging conventional thinking and are more political. For younger managers, Brown says team building, effective mentoring and networking are crucial. And he says today executives need to think beyond traditional borders. “I do think that anybody who aspires to be a leader in this generation, or in the generations to come, needs to focus beyond their own backyard. Anyone who says my aspirations are local is setting themselves up to fail,” he said. He encourages the people he mentors to seek out different types of work experiences to expand their knowledge and understanding. “I also feel very strongly that a lot of leadership is learned and a lot of leadership comes through being in a position to get the right experience and being willing to take advantage of the right experience,” he says. Aspiring executives also should learn to behave like leaders, dressing and acting appropriately, showing humility, and learning to interact with peers and other team members in a way that builds rapport. He says young managers who spend too much time gaining the perks of power often lose sight of the organisation’s goals and how to achieve them. Brown devotes a chapter of his book to communications and urges leaders to listen better to their staff, other managers, competitors and customers, especially in a transcultural setting. LINOs, he says, often act as though listening to customers and rank and file employees is a burden.